Super Bowl LIII is the biggest game of 2019, featuring the New England Patriots and the Los Angeles Rams. Usually, Super Bowl parties are full of chips, dips and wings. However, if you’re having a crowd over, you don’t want to forget about something sweet! These Super Bowl dessert ideas are the perfect crowd pleasers for this year’s Super Bowl party. Chocolate bark is so easy to make and this football themed chocolate bark uses special football shaped candy corn to make it the ideal dessert for a Super Bowl party. Best of all? You can make it the day before, leaving you time to spend with your guests. 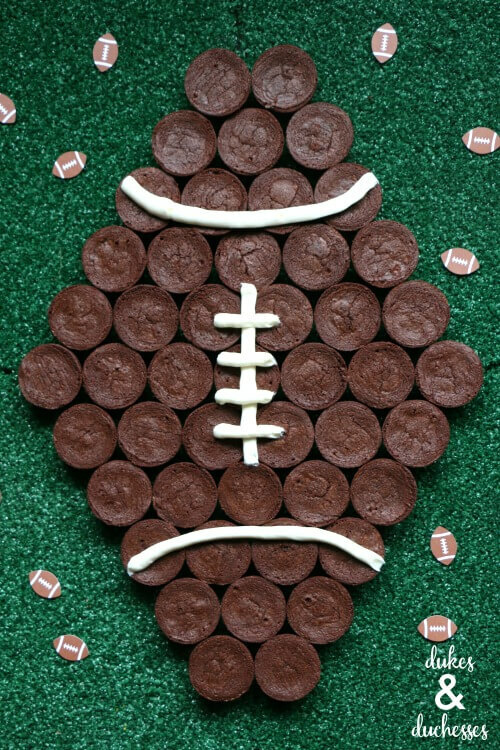 This brownie bite football is so easy to grab on the go, which means it’s a great option for a party. These bite sized, brownie pieces don’t need a plate or a fork to eat and the football shape is the so fun for a Super Bowl party, whether you’re cheering for the Patriots, the Rams or are just there for the snacks. Cocoa Rice Krispies make it easy to make brown footballs and they taste amazing! 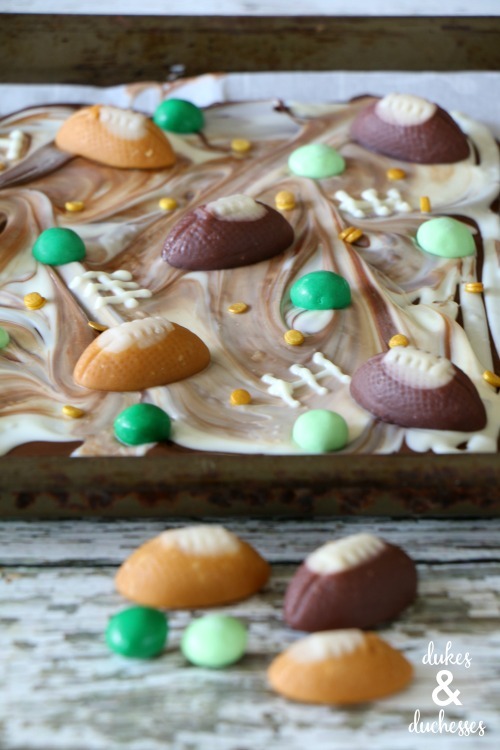 The best thing is that your kids will love to help form these treats into their football shape. Coke floats get a football makeover with a whistle and a free referee printable. Add a wooden spoon adorned with football plays and you’ve got a cool football treat for Super Bowl LIII. These football cupcakes are another dessert idea that’s easy to grab and eat on the go. Short on time? Pick up some chocolate cupcakes at your local grocery store and add the football lacing yourself. These chocolate cereal treats are made with a football shaped cookie cutter so they’re easy to shape without getting your hands dirty. Don’t have a cookie cutter? Cut out a football template out of a piece of cardboard to create the football shapes. These football ice cream sandwiches are so easy to make and a great treat for Super Bowl 2019! Premade ice cream sandwiches just need a little icing laces. Add a wooden stick to make them easy to eat without the mess.